1950: HEY, THAT'S MY WIFE! This photo was in Judy's collection. She was on a date with Bill Beckett, HHS '50. Judy, Bill Hellewell and Alvilda "Sissy" McGlynn were HHS '51 classmates, and of course, Judy Britton Glover and I have been happily married for 54 years as of this year of 2008. 1950" REMEMBER THOSE ANNUAL CLASS ELECTIONS? 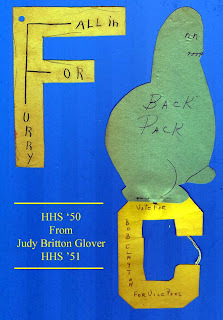 Here's an interesting bit of memorabilia from the class of '50. Carl Pack Vs. Bill Flury for class president. For the real nostalgiacs among us, the green creature sitting on top of the "C" for Bob Clayton who was a Vice Presidential candidate, is a "Schmoo." You may remember that little critter as being featured in Al Capp's "L'il Abner" comic strip. Speaking of Al Capp.....Daisy Mae, I miss you! Jake went to be a teacher in the Hamilton system. He was the consummate athlete, excelling in any and all sports in which he participated. Brother Ronnie went through every year of Kuser School with me, right up to our graduation year at Hamilton High class of '51. Here's another Hamilton faculty member from the White Horse McClain family. Veronica McClain Larkin was one of our faculty at Kuser Annex in the late 1940's. Her sister Julia was the sixth grade teacher at Kuser School. Like her sister Julia, Veronica was a teacher from the old school. She demanded and received respect from her students.